Now that I have some idea of what I want my bug-alien-suit to look like, I need to determine what kind of materials to make it out of. My requirements are that it must be inexpensive, and must be adjustable to fit different-sized people. Meet my assistant, Manny. He is wearing a purchased black flight suit (about $40 from DarkThreads.com) - this is what I am using as the base for the costumes because it comes in a range of sizes, and I think it will be easy to work with. My plan is to make a bug-like exoskeleton consisting of segmented pieces, and then attach them to the suits with velcro. I will sew strips of the loop side to the suits, and attach the hook side to the bug armor pieces. As for what to make the armor out of, there are a lot of possible options, but I think that those interlocking foam floor tiles - the kind you can get at the home/hardware store - will be inexpensive and easy to work with. I found them at Big Lots for about $12 for a package of 4 - 2' square tiles. I am going to take the same idea and apply it to my "bug exoskeleton." I promised sketches, but I realized something - I'm not that good at sketching. But that's not the only method you can use to create a new design. Being a seamstress, I usually start off by draping, so that's actually what I did to design my "bug-like alien" costume. 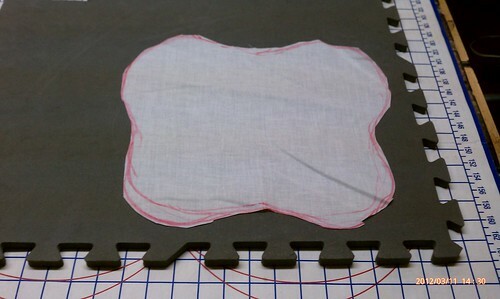 I draped a piece of muslin (scrap fabric) onto Manny and drew the shape of the chest piece. This is what I will use as the pattern to cut out the chest piece. If you don't have an assistant like mine, you can certainly employ a friend to help with this part. You could also use poster board to create the pattern, or whatever method you prefer, but I highly recommend creating a pattern or using some sort of template first before you start cutting!! - which will be the topic of my next post.